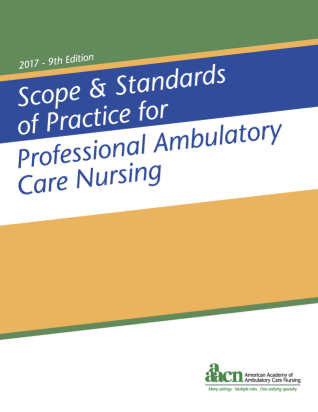 The scope of practice statement addresses the definition and unique characteristics of ambulatory care nursing, the conceptual framework, its history over the past 30 years, the diverse types of ambulatory care settings, the roles of ambulatory care RNs, the trends and issues in ambulatory care and future directions. The standards specify the competencies needed for professional clinical and administrative practice. 3. Additional standard statements and measurement criteria for nurseexecutives, administrators, and managers. Preview Sample Pages from this Book.